Deuter Aircontact Lite 40 + 10 backpack for men is from their new 2018 series, a lightweight pack with an excellent adjustable harness and a strong suspension system. Deuter Aircontact Lite 40 + 10 Backpack For Men. 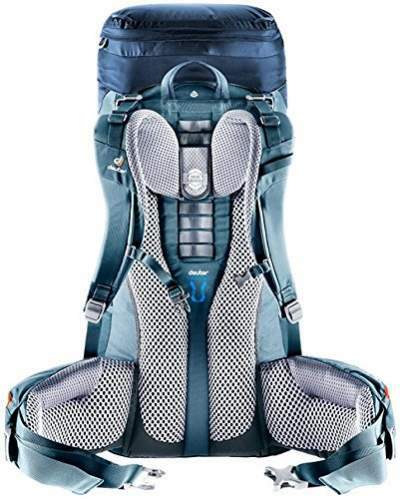 This new 2018 Aircontact Lite series includes several packs in the range 35 – 65 liters, with separate series for men and women; the latter have the letter SL in the name. So this Aircontact Lite 40 + 10 for men is in the middle of the series by its size. This series should not be mixed with their ACT Lite packs that have been around for many years already. The same holds for their ACT Zero packs which are a different series. This is an advanced series with a great comfort, breathable materials, and with zippers which you can use even with gloves. Now, how ‘lite’ this particular pack is you will be able to judge below when you see it side by side with some of its competitors. Note that the corresponding pack for women is the Aircontact Lite 35+10 SL. This is the pack with an expanded collar. The pack is with a separate bottom compartment and you have a divider with a zipper, so it is completely separated and not just a shelf with toggles what you can see in some even very expensive packs from the top brands. But you can keep it open and have one large compartment instead of two. This is a hydration compatible pack with an internal sleeve and a tube exit port in the middle. 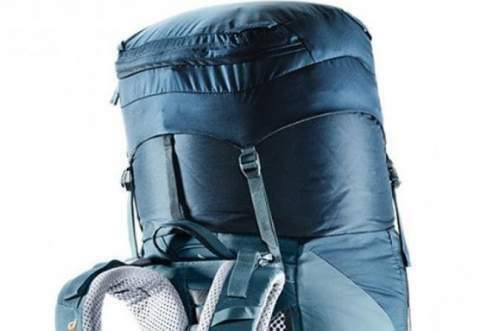 Size-wise, with the total capacity of 50 liters (with the expanded collar) this pack is perfect for overnight or weekend hiking and mountaineering tours. Note that it has the usual attachment elements (more below) so you can attach lots of stuff from outside. Weight-wise, it weighs 3.7 lb (1680 g) so it is not an ultra-lightweight pack. When you see how well padded and durable this pack is, you realize why the weight. It is built to carry the load comfortably. Deuter uses several different concepts in their suspension systems. So the one you have here is based on the idea that the pack remains close to the body. This makes it different from their famous trampoline style system used in the Futura packs, which I have been using for 15 years already. So you have an X-shaped aluminum frame for stability and rigidity while remaining flexible, and to transfers the load to the hip belt. The picture below shows the central ventilation chimney and the padded sections on the sides. My guess is that this structure is behind the word Aircontact in the name of the pack. The padding is massive and this is an open cell foam with a hollow chamber inside. When you carry such a pack you always feel those two foam pads on your back. So the feeling is quite different when I compare it with my Futura packs. I guess this is also dependent on the body shape. The hip belt is with a massive dual density foam for stability and for cushioning, and these different sections are visible in the picture above. The belt allows some freedom of movement, much more than what you have in the Futura packs where the connection with the back of the pack is rigid. This is an ergonomically cut, compact, ECL hip fins system that custom fit the hips, this means you have pads that precisely adjust to the hip and provide a comfortable hold of the load. The front straps are a pull-forward type, so you have a V-shape on both sides and when you pull you have a perfect hugging around your hip bones. There are 7 pockets in total, two are in the lid (one external and one underneath the lid), two zippered pockets on the hip belt, and two stretch mesh pockets are on the sides. On the front, you also have a large mesh stretch pocket, with a buckle on the top, so here you can store your gear needed on the go, and your wet stuff as well. 4 loops are on the front, for a helmet holder (sold separately) or for any other item. There are also 4 loops on the lid, so you can attach a solar cell charger. You have dual loops for trekking poles on the bottom, paired with two bungee tie-offs higher on the pack. There are two attachment loops on the bottom as well, the blue loops visible in the pictures. Two more in the same color are on the front, the mentioned bungee tie-offs are attached to them but you can still attach other things. Dual compression straps are on each side of the pack. The lower you can pass through the stretch pockets to cinch the pack, or over the pocket to stabilize any item carried in it. Note that there are no bottom compression straps; only the largest packs in the series have them. Pity. For extra stability, on both sides of the hip belt, you have straps to cinch the belt and move it closer to the pack. There is no rain cover in this series, pity. As mentioned above, the largest packs from this series do have bottom straps, see their 65 + 10 and 60 + 10 SL versions. Weight: 3.7 lb (1680 g). Volume: 2441 + 610 in³ (40 + 10 liters). Dimensions (H x W x D): 29.1 x 11.8 x 8.7 in (74 x 30 x 22 cm). Torso fit: 15 – 20 in (38 – 51 cm). Here I give two top quality packs from other renown brands so you can get some feeling about the features of this Aircontact Lite pack. As you see, it is not particularly lightweight, I would say it is quite standard. But it has a bottom compartment with a zipper, and a true divider inside with a zipper, and this all adds weight. Please follow the links to compare the prices. 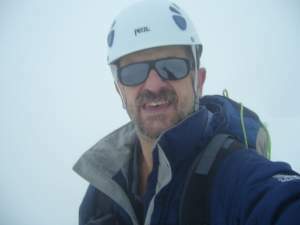 The Deuter Aircontact Lite 40 + 10 backpack for men is a top quality item. It may look similar to the Futura packs when you see it from the front, but this is a completely different suspension system. This is a new series and it is here to stay for many years. I already mentioned several other packs from this series, but if you still need something different please check my page with medium size backpacks. 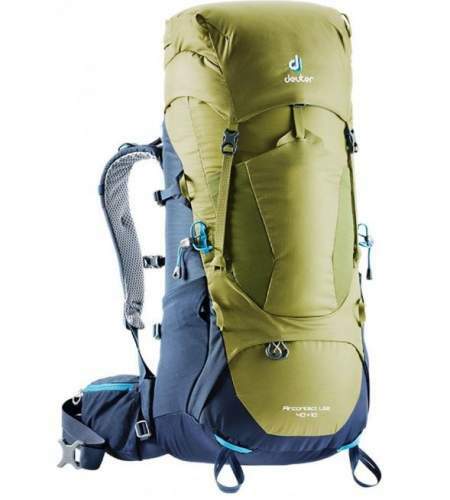 You might want to compare it with this Deuter Futura PRO 44 EL Pack from the same brand. Check also this Mountainsmith Approach 45 Backpack if you want a panel-loading type. If ventilation is essential, check this Osprey Rook 50 Backpack.